Far too often here you read about all the examples of bad customer service that I hear about from time to time with the different cruise lines. The thing is though we all know how great the service is onboard a cruise ship, so rather than moaning again I thought I'd share an example of some of the best customer service I've ever experienced whilst on a cruise. As any regular readers will know I was recently onboard the P&O Arcadia for a mini cruise to Bruges and back for our works Christmas party, (I'll get a review posted soon I promise). Anyway on the second night a bunch of us got together for a mini poker tournament, (I came second but still think I was robbed for anyone interested), with just a small £10 stake per person. was fine with this by the way). 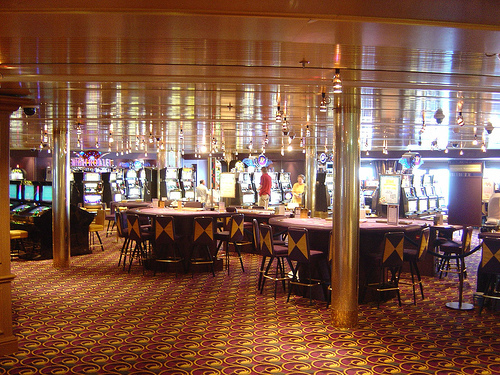 Now I was convinced you couldn't spend your onboard credit in the casino and have told a lot of my customers the same thing but we didn't think it would do any harm to ask the casino attendant. She was a really nice lady who confirmed that yes I could use my onboard credit to buy casino chips. I still wasn't sure so I asked her to double check and she said definitely yes. So I took out £10's worth of casino chips and settled up with Faz. You can guess what happened next can't you? I got my bill through in the morning and it showed as £10 being spent in the casino but didn't show against my onboard credit. As it was only £10 I decided to just leave it and chalk it up to experience but as I was disembarking I happened to be passing the reception desk anyway so decided to mention it just to see what they'd say. As I'd guessed the casino attendant was wrong and you can't spend your onboard credit in a cruise ship casino however they quite happily refunded me the £10 plus, and the is the bit I was amazed by, they gave me back all my unspent onboard credit as an apology!!!! £25 better off and over the moon with P&O customer service I disembarked the ship.